Bonsai plants are unique additions to any home that have a lot of beneficial qualities. One of their primary benefits is that they improve air quality by turning carbon dioxide into oxygen, thus keeping the air fresher and cleaner. Bonsai plants are also very visually appealing and have a look unlike any other, making them a wonderful element either inside your home or within your outdoor landscaping design. In addition, studies have shown that indoor plants like bonsai have a significant positive effect on your psychological well-being, as nature is proven to reduce stress. 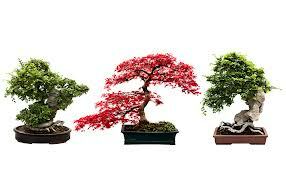 Japanese Red Maple – This bonsai is liked for its beautiful, formal qualities. During spring, it is a magnificent red orange color, and then during summer, its leaves turn dark red. Its foliage is delicate, but compact. Cotoneaster – Of all the bonsai varieties, this is the easiest to care for. It is a miniature version of a hardy type of plant that has beautiful flowers and leaves. This is easy to care for because it can thrive under a variety of conditions. Chinese Elm – This is the recommended tree for first-time bonsai caretakers since it can survive any condition, whether indoors or outdoors. This bonsai plant requires pruning, but its growth pattern is fairly predictable, making it easy to care for. What makes it more distinct among others is the evergreen color of its bark. Brazilian Rain Tree – The Brazilian rain tree is well liked for its compound foliage with delicate branches. When this bonsai plant matures, pieces of bark fall off, which results in a beautiful contrast of dark and light colors on its trunk.